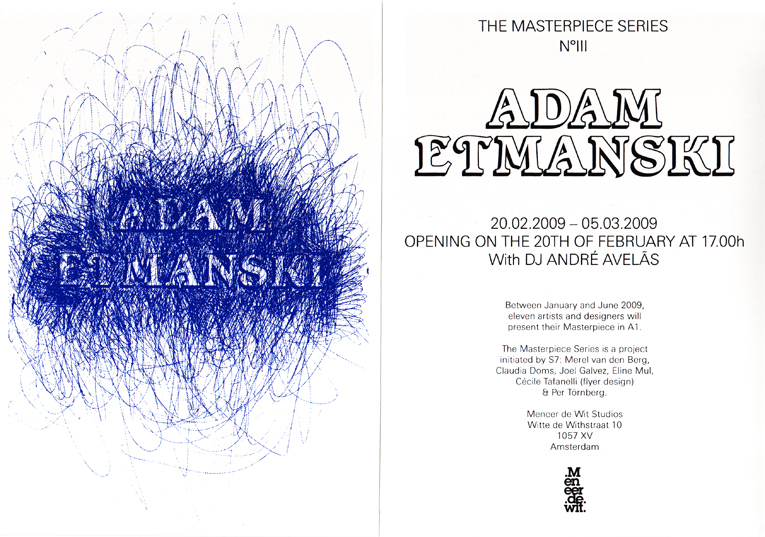 … will continue with a work by ADAM ETMANSKI! Please join us for the opening on Friday, February 20th at 17:00h, Meneer de Wit Studios, Witte de Withstraat 10. DJ under the stairs will be: André Avelãs! 11 artists and designers were asked to hand in their Masterpiece in A1. There were no restrictions concerning content and technique. Between January and June 2009 these works will be presented in a 2-weeks-cycle in the showcase of Meneer de Wit, Amsterdam. THE MASTERPIECE SERIES is a project by S7 – Claudia Doms, Joel Galvez, Eline Mul, Cécile Tafanelli, Per Törnberg and Merel van den Berg.